Ogoh-ogoh festival is usually held every year, and its festivities can be seen in every corner of the village or town square across the island of Bali. This festival takes place on the eve of Nyepi Day, known as Tawur Agung Kesanga or Pengerupukan. It is a display of cultural values, traditions, and art. The word ogoh-ogoh is derived from Balinese "ogah-ogah", which means something that is shaken. Ogoh-ogoh usually stands on a pad (made of wood and bamboo) which sustains it when is lifted and paraded. After arriving at a certain spot, the lifters will shake it, so it looks like dancing (ogah-ogah) on the pad. The process of making is usually dominated by young people (often called Sekehe Teruna Teruni). The traditional ogoh-ogoh is made of bamboo woven, coated with paper and glue. Then is painted with attractive colors and equipped with certain ornaments. The process can take a long time, depending on the shape and level of complexity. Most ogoh-ogoh has form of mythological being or demons (rakshasa). This creation has spiritual aims for the purification of the environment from the negative energy created from the activities of living being, especially humans. The form of ogoh-ogoh represents the "Bhuta-Kala", Bhuta: the symbol of power/energy of the universe, Kala: the symbol of eternal time. A special ritual is conducted before the festival takes place. Then, the ogoh-ogoh is lifted and paraded along the main street, villages, or town square and accompanied by musical instrument, the Gambelan Baleganjur. At the end of the festival, it is usually burned into ash in the local cemetery as a symbol of self-purification. 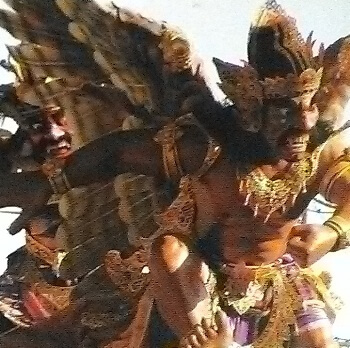 The ogoh-ogoh is estimated to have existed since the era of Dalem Balingkang and has important roles in Pitra Yadnya ceremony. It is also mentioned to be related to "Barong Landung", as the beginning of ogoh-ogoh that exists today. Furthermore, in 1983 ogoh-ogoh was firstly made associated with Nyepi Day. At that time, Nyepi day was included as one of the national holidays. Then, the creation was involved in the Bali Arts Festival (PKB) XII.